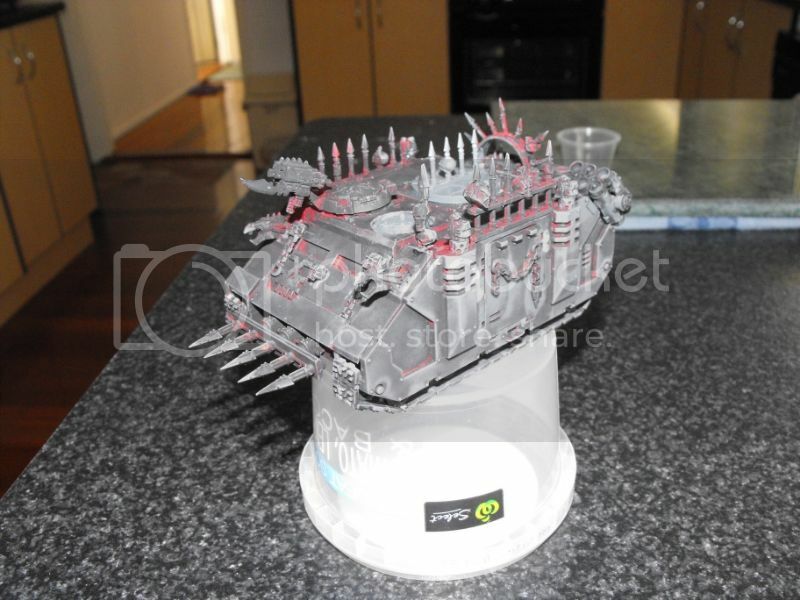 I've dug up a long shelved army, my World Eaters raiding fleet the 'Void Reavers'. 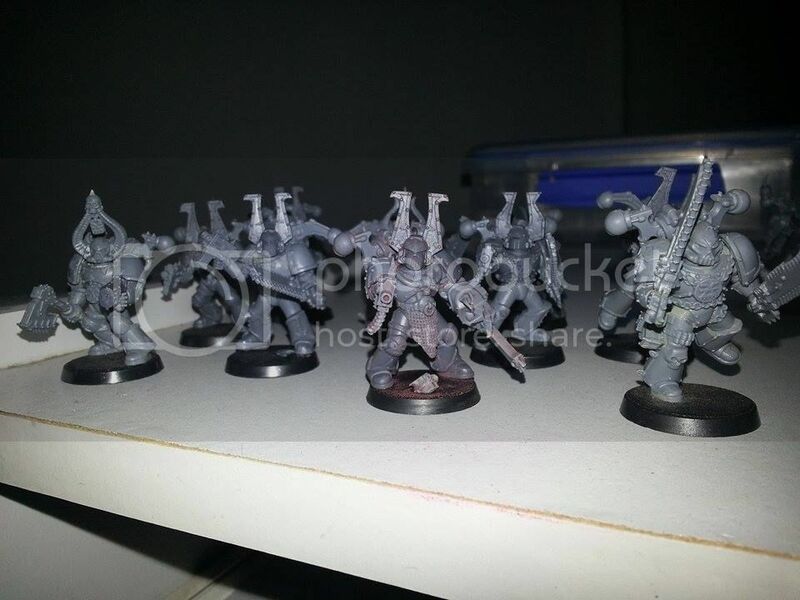 It started years ago as a Space Hulk project (using a system that allowed for any 40k units to be used as enemies - replacing Genestealers) and over time turned into a full fledged army. 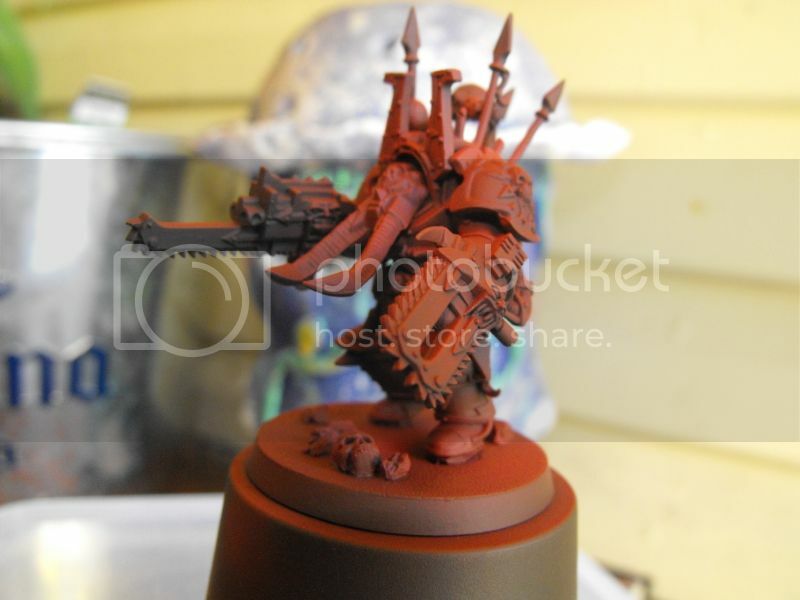 Life and other projects slowly took my attention away from it and left them unpainted or even used in years. I stripped off all the paint, pulled off most of the detail bits and even had to redo the tracks. It was one of those projects that was simply handed to me and told "See what you can do." and it was in such a state that in the end it was pity that inspired me to not just hand it back after it had been sitting on my painting desk for a few weeks. 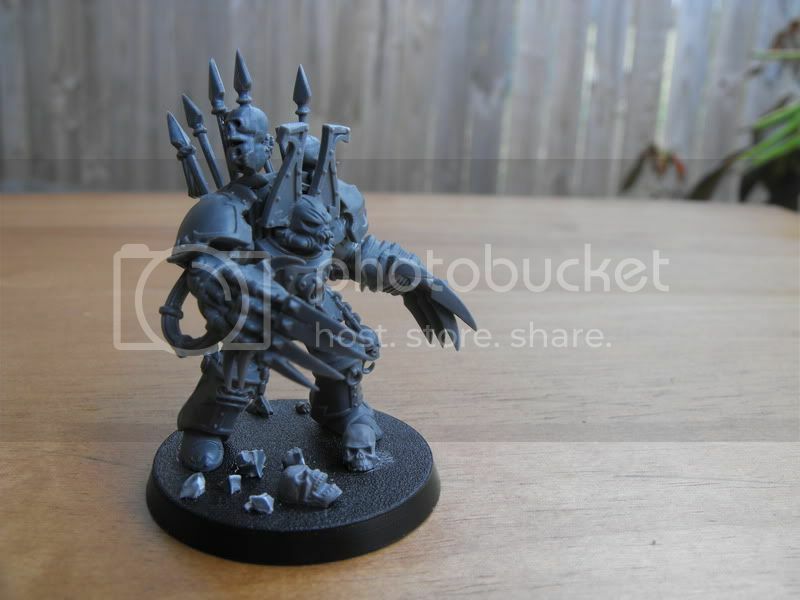 I really should have taken a picture of the before, just picture a 15 min build and a 5 min paint job. I was really pleased with the end result, particularly taken with the central hub I fit into the Razorback/Predator panel that the owner had used in stead of the usual doors. 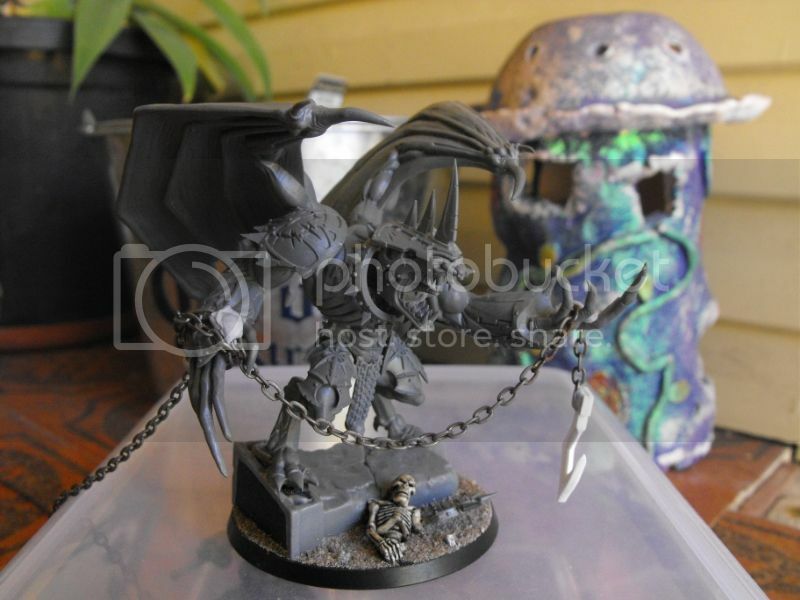 It reminded me of what gave me the Chaos bug all those years ago, so much freedom with the builds and conversions. Then, which is where I get slowed down the most, the painting went from A to Z without a hitch. It was the first project where all the skills I've been working on for the last year, as a new airbrusher, all came together and worked. Not to mention my first time with Vallejo's Liquid Gold. I was really happy with how the whole thing turned out, I was almost tempted to buy it off him. 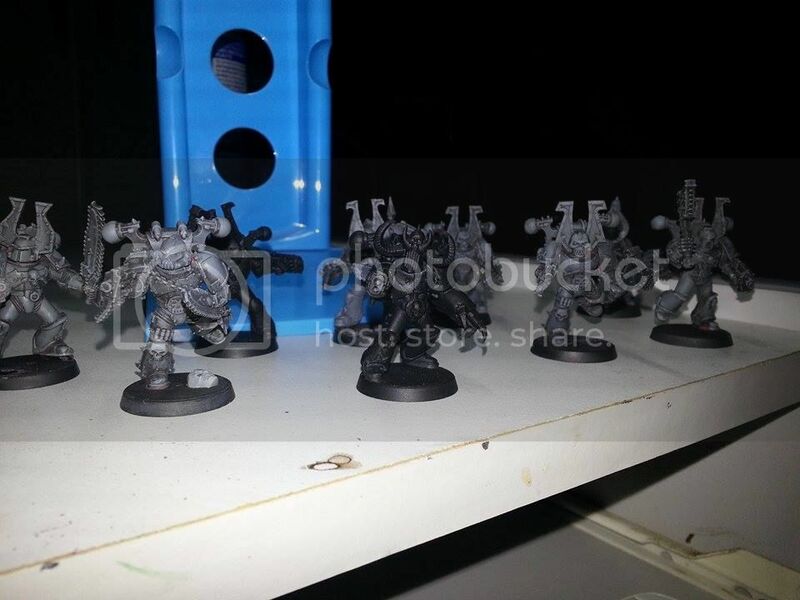 About a week later I dragged out the first squad I ever brought for my World Eaters, a set of Terminators, and had a game of Space Hulk with them. I had a ball and that night I threw them into a tub of metholated spirits and started updating the moddeling the next day. 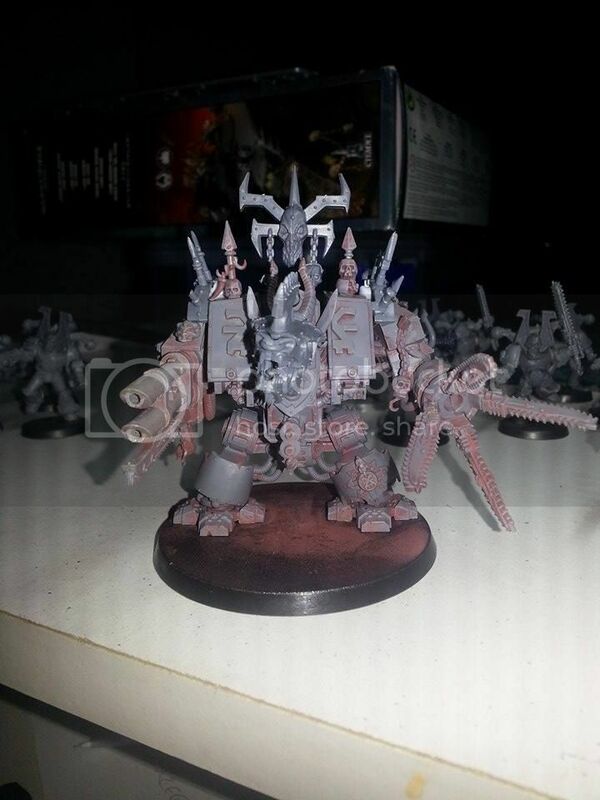 Now I want to paint to whole army up in my new spiffy scheme. Since then I've been gong through most of the army and stripping and remodelling anything that I didn't feel was up to snuff. 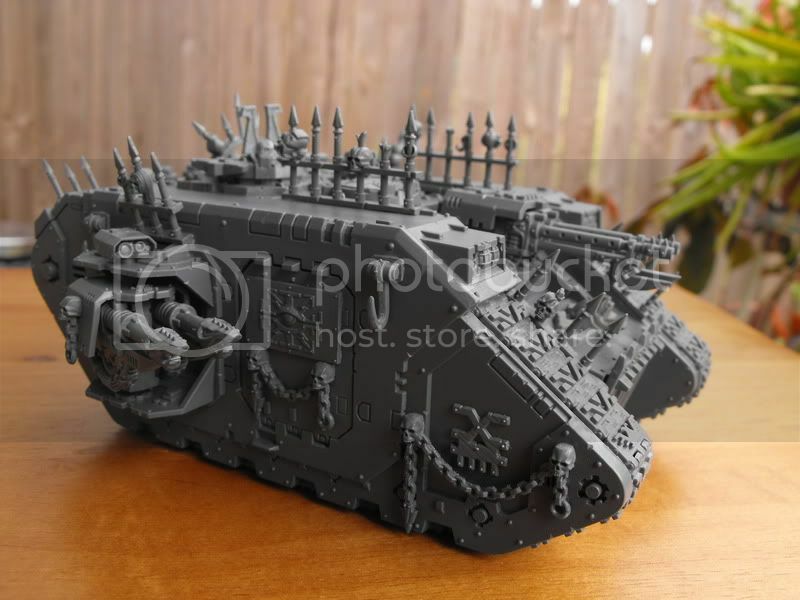 I've mostly been posting things on Facebook communities for feedback, but I decided it was time to not only go back to an old army, but go back to having a 40k log of my work. So here I am. This is what's sitting on my desk right now and occupying all my attention. 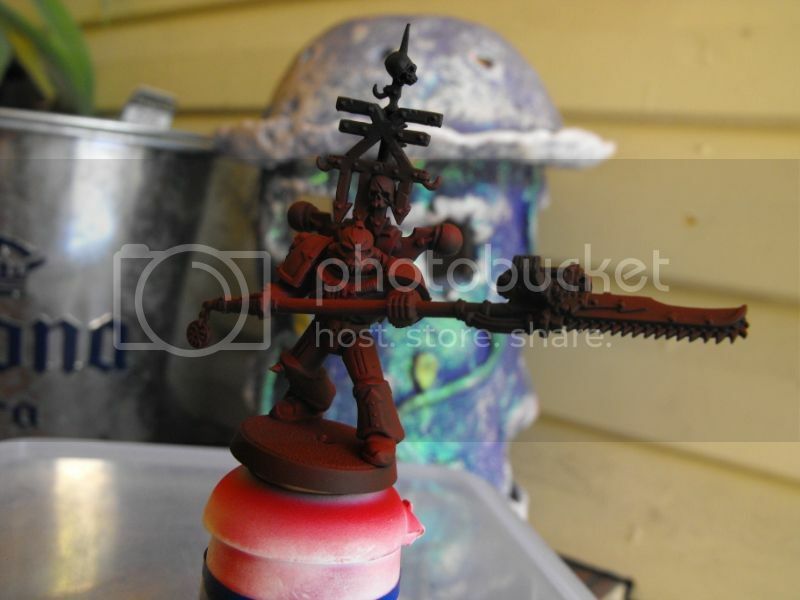 Belial, my AOBR Dread converted years ago and now getting a makeover. 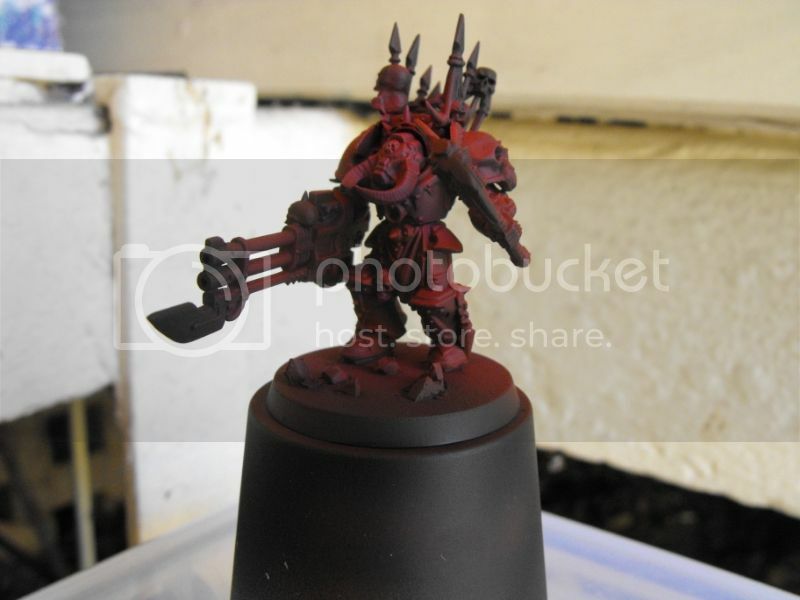 And his WIP rebuild, that I'm really happy with, as of last night. Here is a preview of some of the things that I will give more attention in future posts. 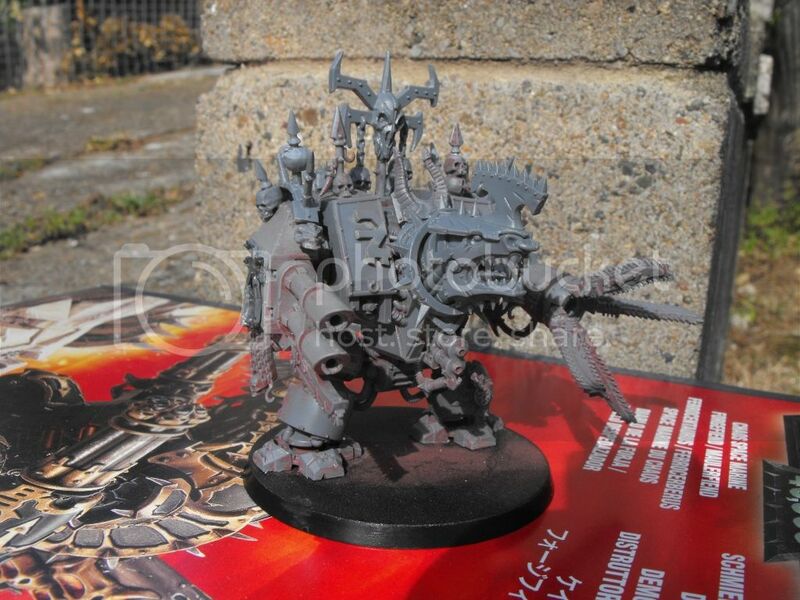 My Defiler conversion getting a makeover. 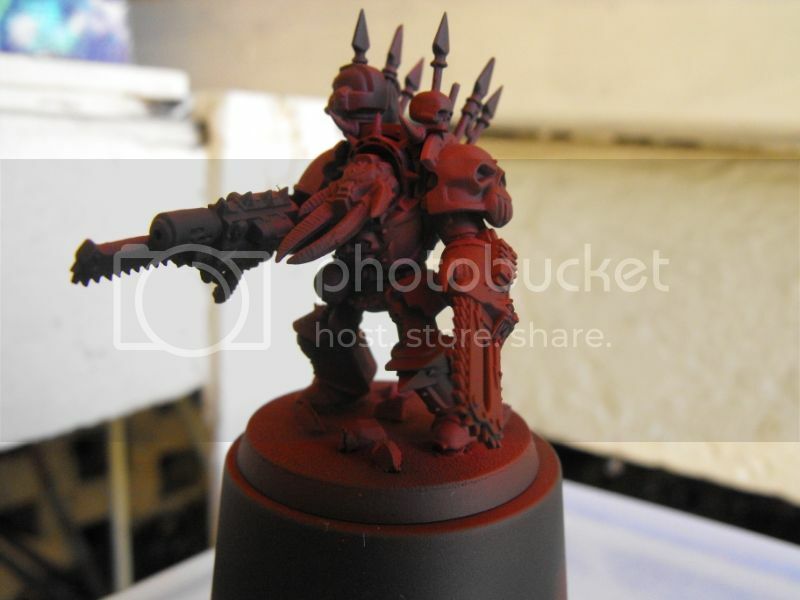 Sorry for the poor pictures, but these are previews, they will get more photographic love later. 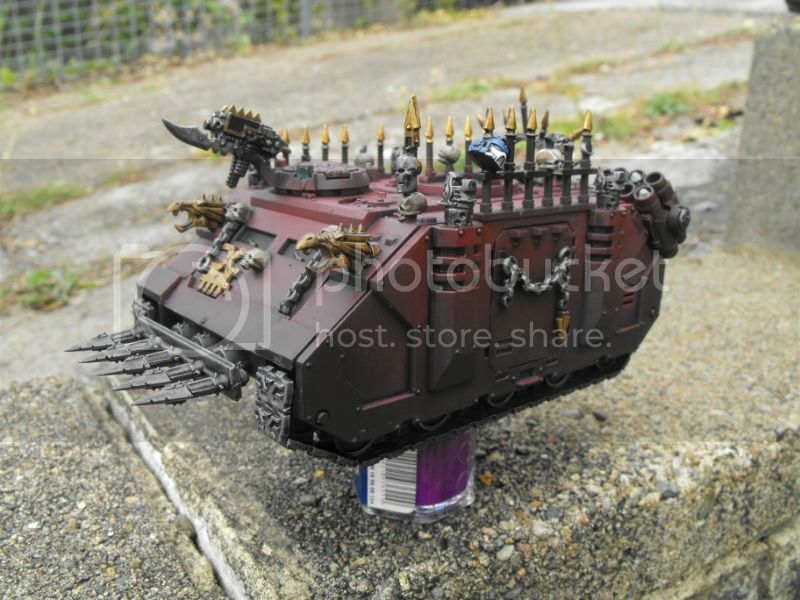 Not pictured; 10 Khornate Terminators who are actually my pride and joy in the whole army currently, along side their Lord. Thanks for looking, C&C encouraged and welcome! The Blood and the Fury must flow! Edited by Usiel, 05 November 2014 - 03:43 PM. "The Astartes in war is a shocking, savage sight." 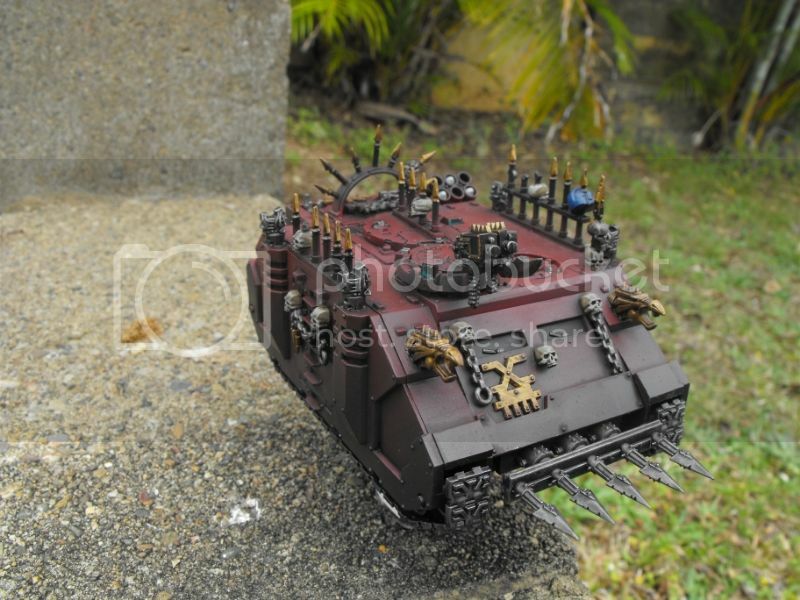 Lemmingspawn: "But it's an evil destructive robot so I have to speak of aesthetics and artistic appeal in hushed tones so it does not attempt to destroy me..."
As promised images of my pride and joy, the Berzerker elite. 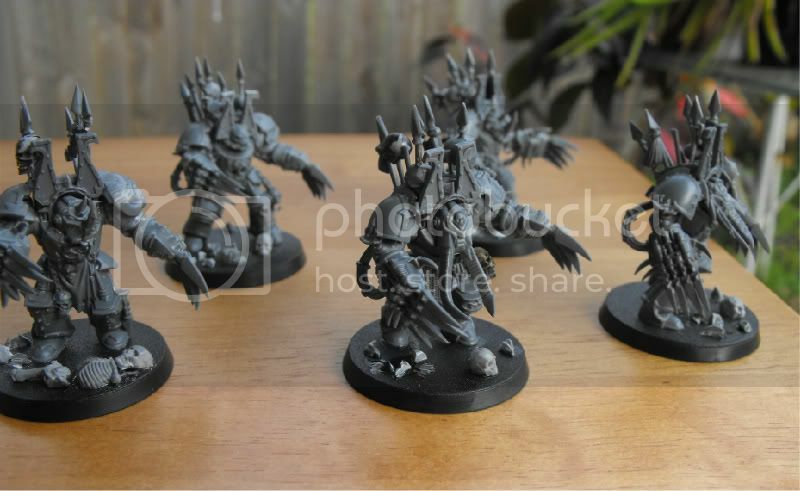 This first lot are the aforementioned revamped squad of Terminators that were the first ever brought for my World Eaters. 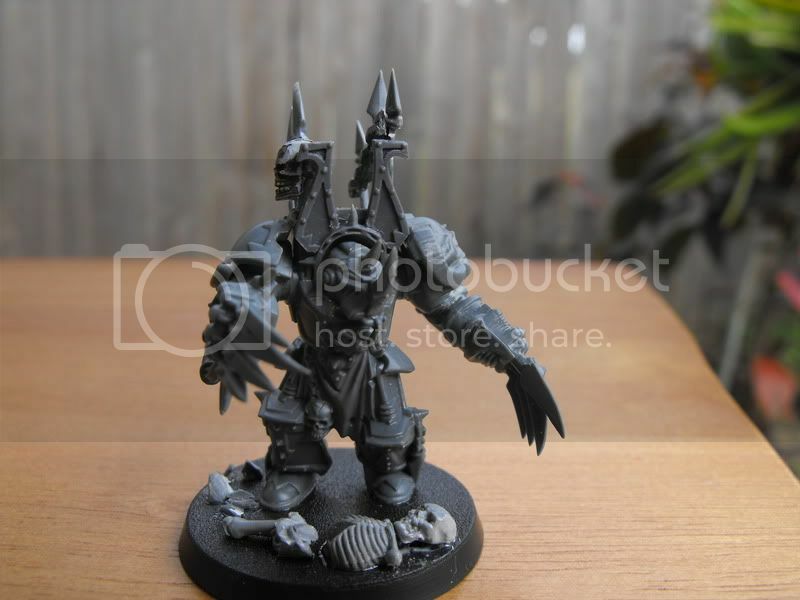 Most of the tweaks are very small, except for the Khornate Horns, which I did want on all of them but logistically it was a bit of a nightmare barring two of them, but I think they still look quite good as a unit without that on them all. Of the set, this one is probably my favourite. Note the slimmed down bayonet. The Reaper: Replaced the bayonet for a nicer one and added a skull and chain among the trophy racks to strengthen them structurally, I've done this to a few where needed. Champion: If there was a leader, it's him. I saved him for last because he's out of focus, sorry. This is a squad I did more recently, the last addition to this army before I shelved them before this revamp. 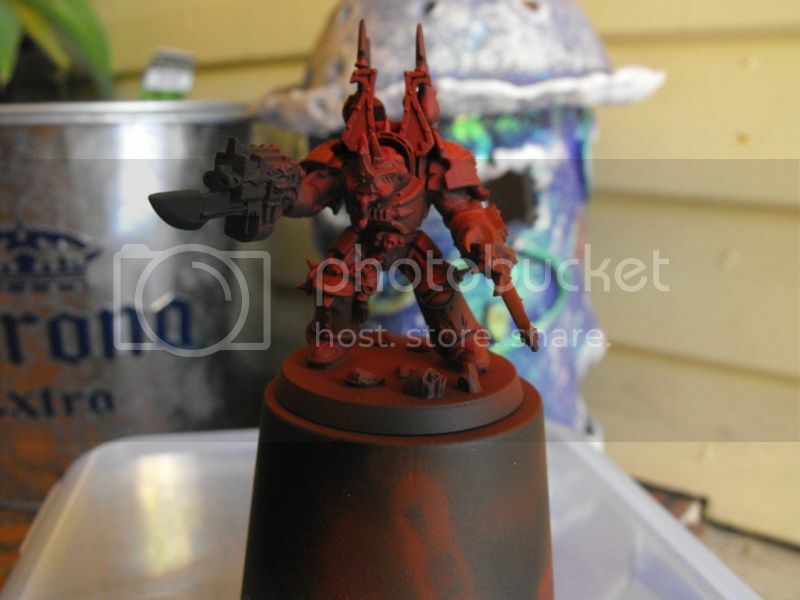 I'm very happy with them and will likely only strip off the red chocolate primer I used on them before repainting. Oh and I've taken to gluing about 1mm of plastic under models feed to raise them up and let the flock move under their feet a little, so that too. 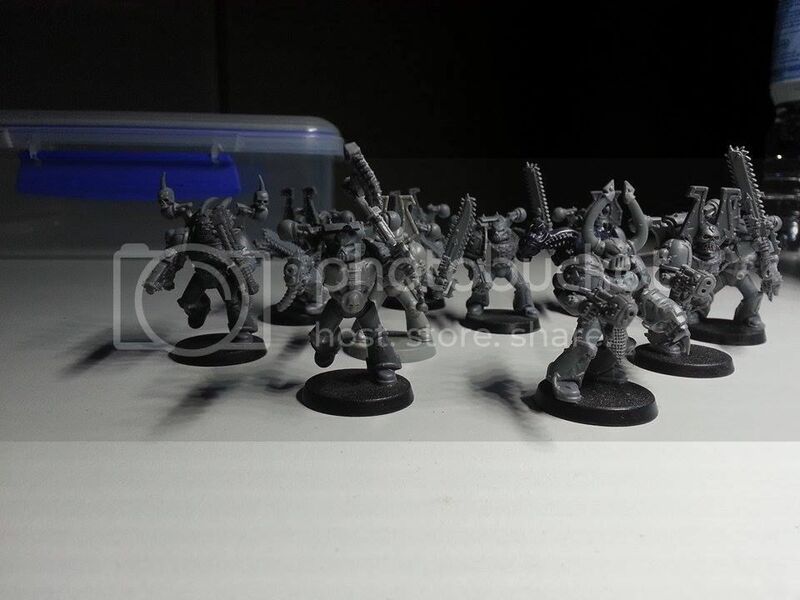 They are the personal retinue of Lord Barraka, the commander of this raiding fleet. Like the fellows above they've been given Khonate Horns, skulls and chains in the trophy racks and a few extra skulls. 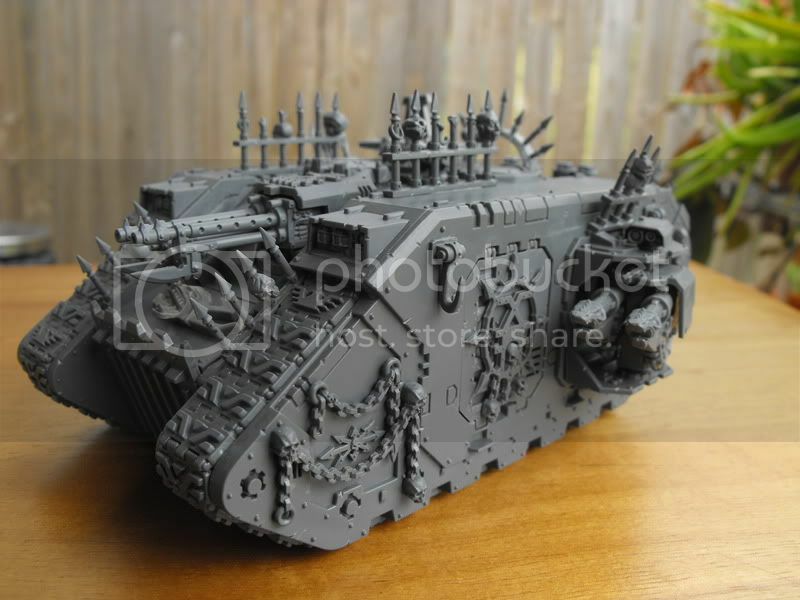 Landraider 'Gorgon' the elites transport, probbaly my second favourite piece in the army. 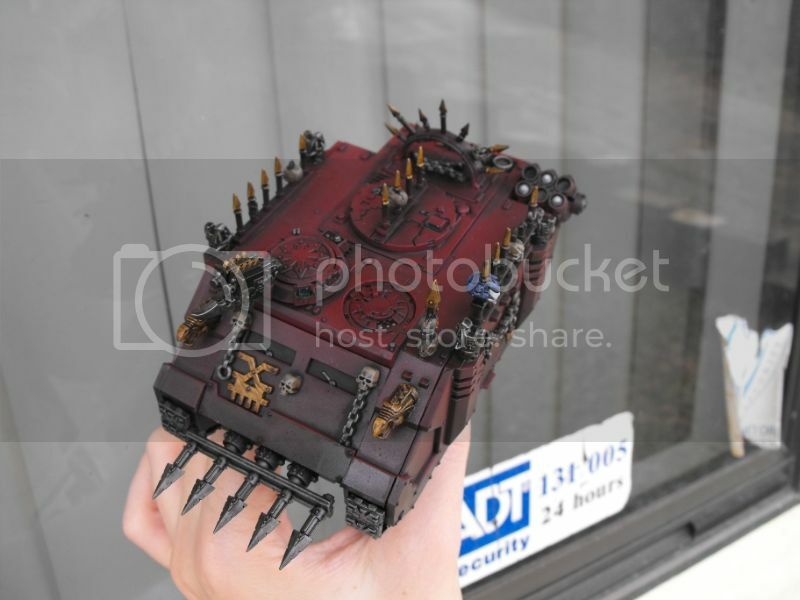 I was never a fan of the 'Marine tanks with crap stuck on them' look of GW's chaos tanks, but I was really happy with the finished result of this one. 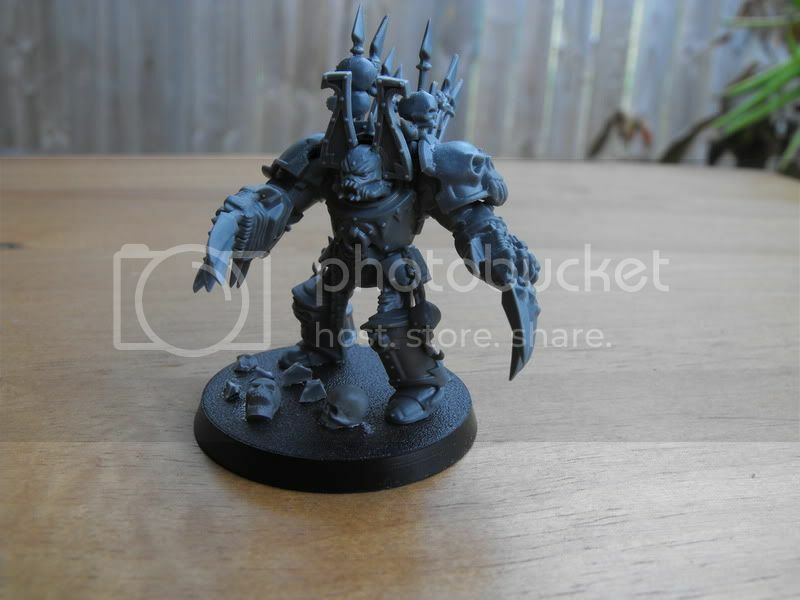 Barraka the white daemon, unchanged since his first build years ago and in need of a metho bath to get that horrid primer off him. 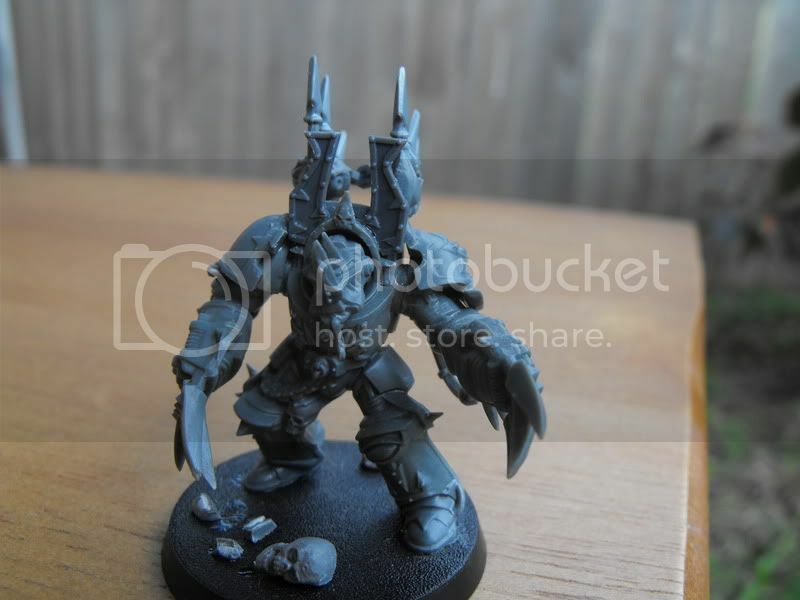 I suspect in future I will make another Barraka using elements from kits that didn't exist back then, like Skullcrusher shoulder pads. 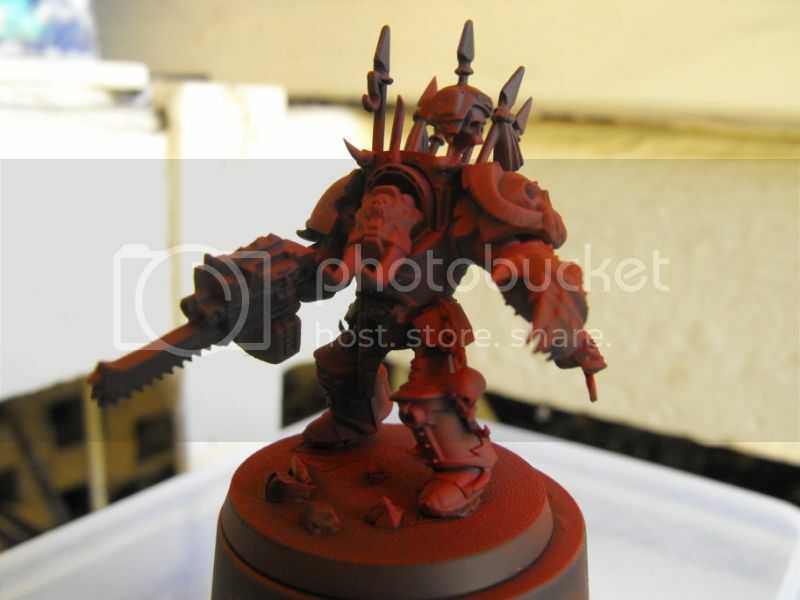 And finally a slightly better shot of one of my Berzerkers with his airbrushing done. Sorry for how dark this shot is, photography isn't my strong suit. 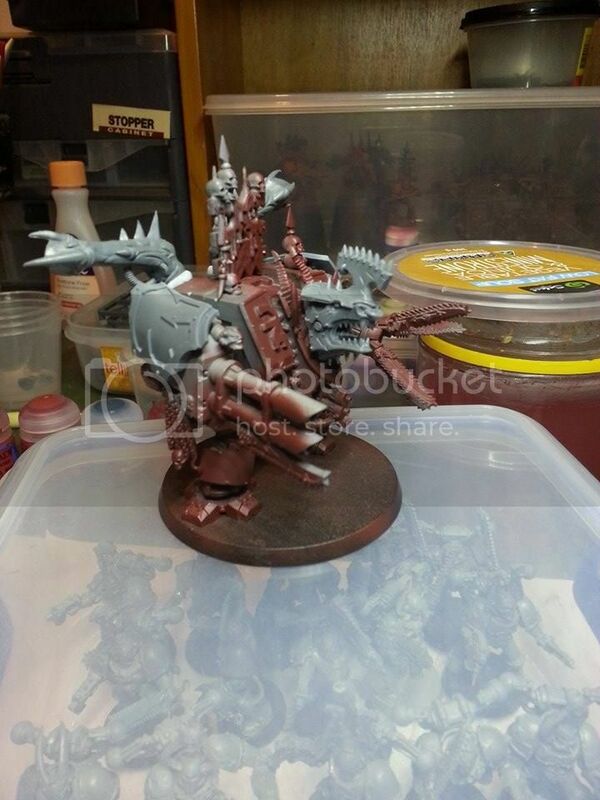 And that brings this log up to speed with the whole army so far. I've got a lot of work ahead of me and already I'm eyeing off more kits to swell the ranks. I suspect I'm one of those hobbyists who dreads having an empty workbench.. maybe I'm just a masochist. Thanks for looking, C&C encouraged and welcome. Edited by Usiel, 05 November 2014 - 03:45 PM. 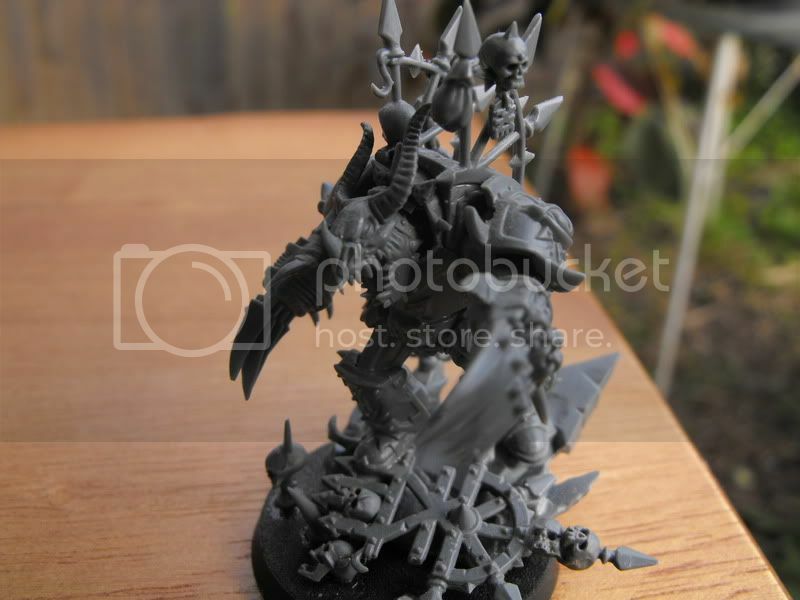 My Wartorn roleplaying Warband went from a combined Nurgle/Khornate Warband into a Khornate one with high proliferation of hemophages and blood born bio weapons that cause hemoradging (can't spell) and explosive bursts of blood. 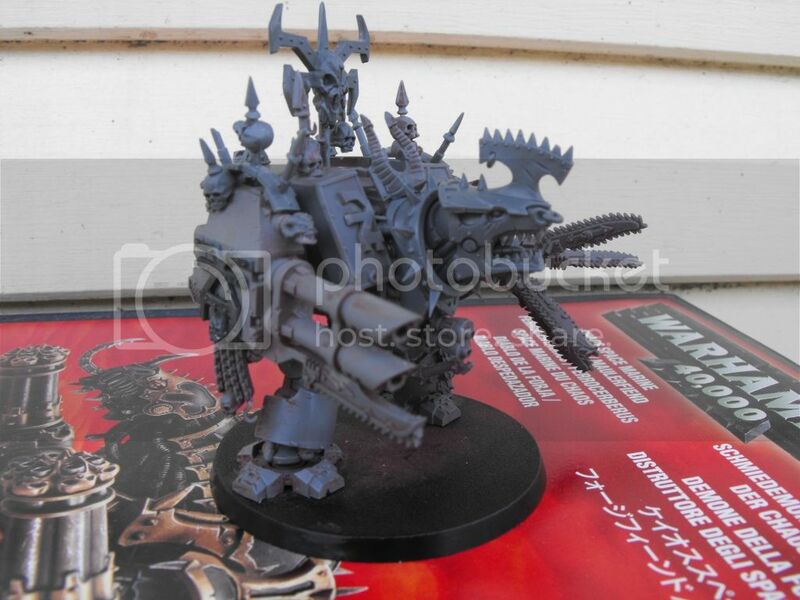 Anyway, looks like you're well on the way to an amazing World Eaters force! 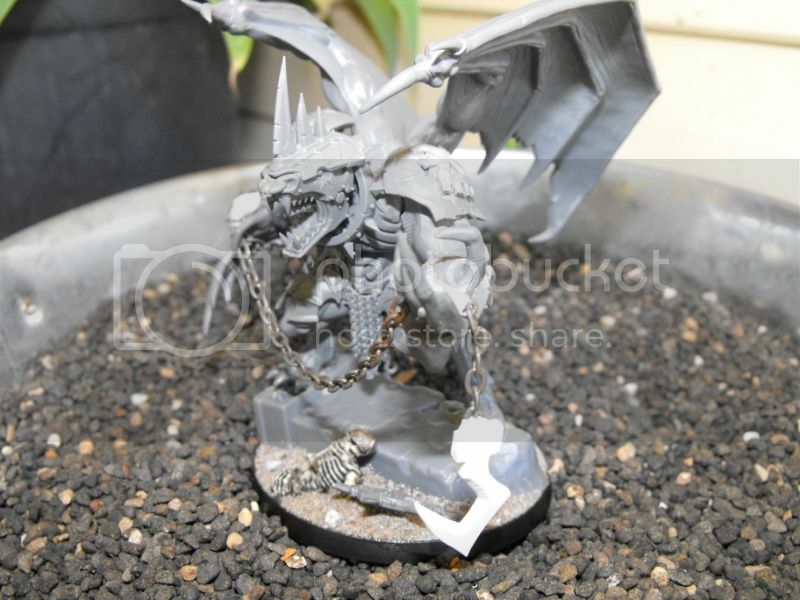 I particularly like the Daemon Prince, and glaive berzerker! 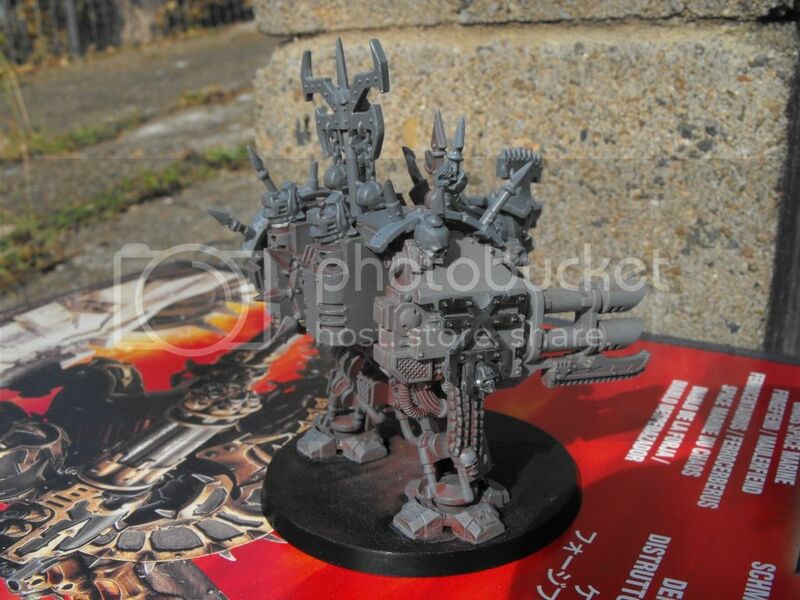 The bunny ears on the Terminators are a must, of course, and the HeroQuest gargoyle head on the Land Raider is a beautiful (if slightly sacrilegious) touch! 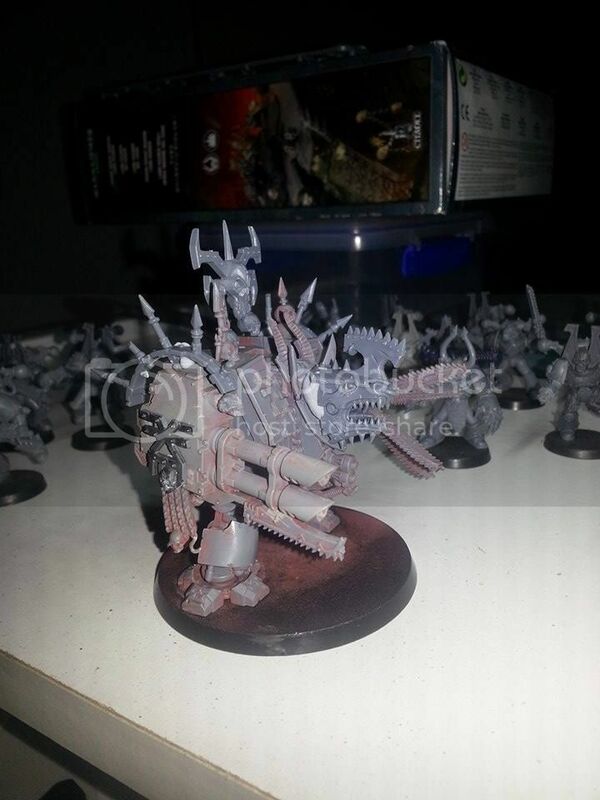 When it comes to your Defiler, I have to admit that I think your original build with the Lascannons was rather elegant! 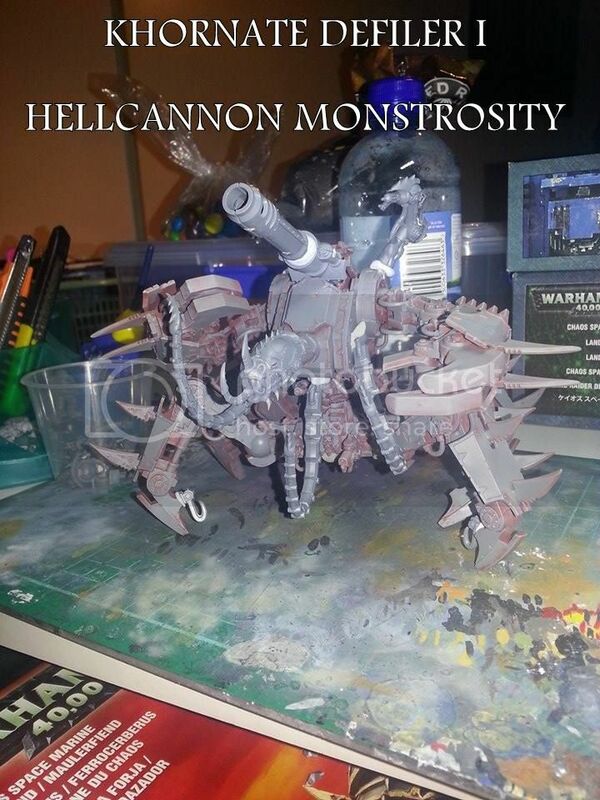 If, however, you feel more comfortable with one of the rebuilds, I would definitely go for the second one, since it manages to convey the impression of a strangely organic artillery weapon. 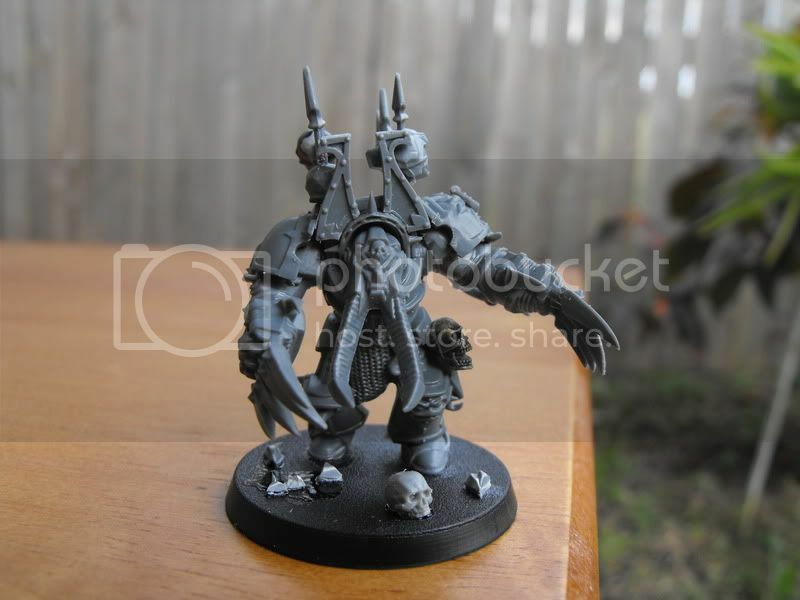 In that case, I'd rather use the Cerberite head from the fiend kit, though: Even though I like the juggernaut-like head better, the other head would be a better match for the more angular design of the Defiler. Some real cool stuff here. 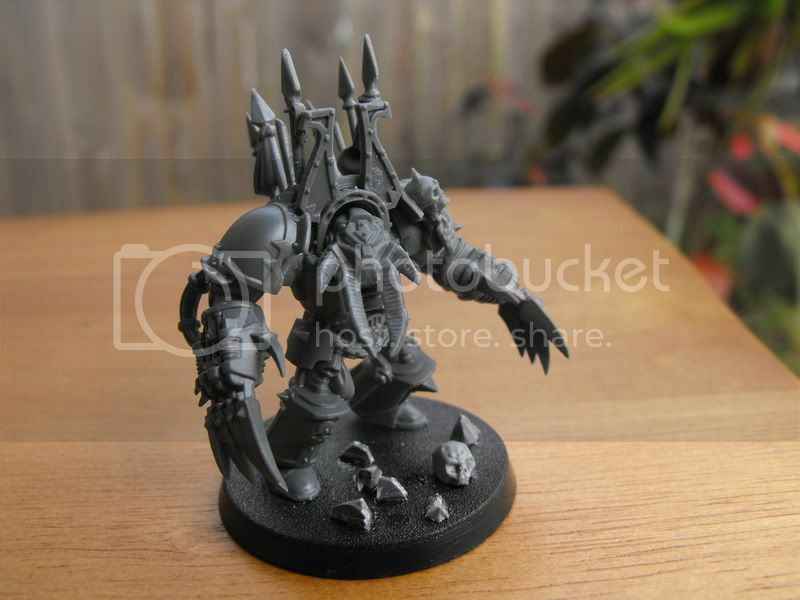 Yes, I wanted to ask you how you mounted the Jugger head on your dread. 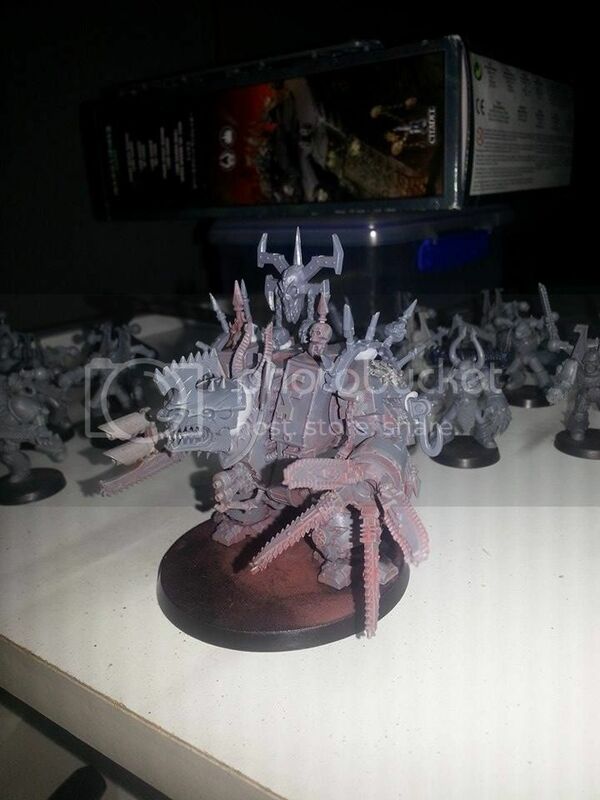 It's too late to employ on my dread, but I think I might look at using those ugly CCW tentacles to make the neck on my defiler conversion. 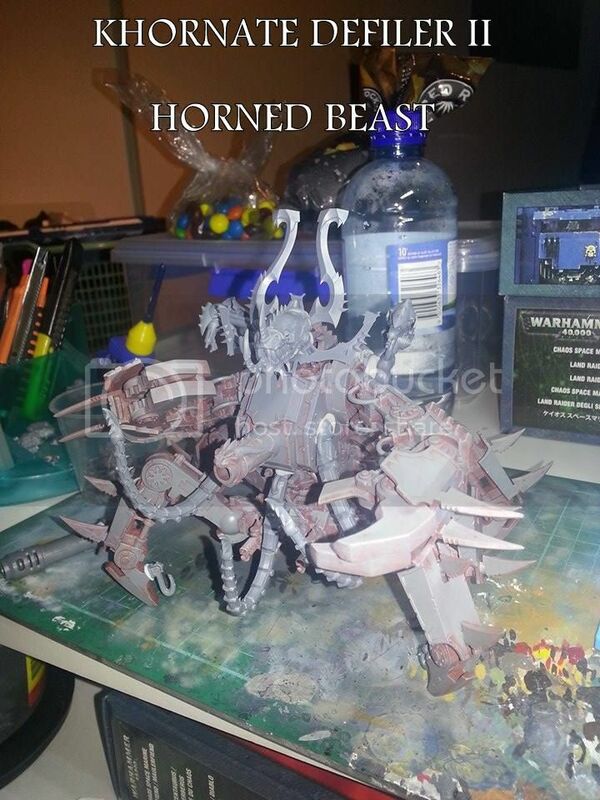 I also agree on the aesthetics of the original Defiler build, but when I reconsidered it as a Khonate construct, the 'range focus' felt wrong and I thought I could make it more monstrous by adding a stronger close combat theme and a big gnarly head. 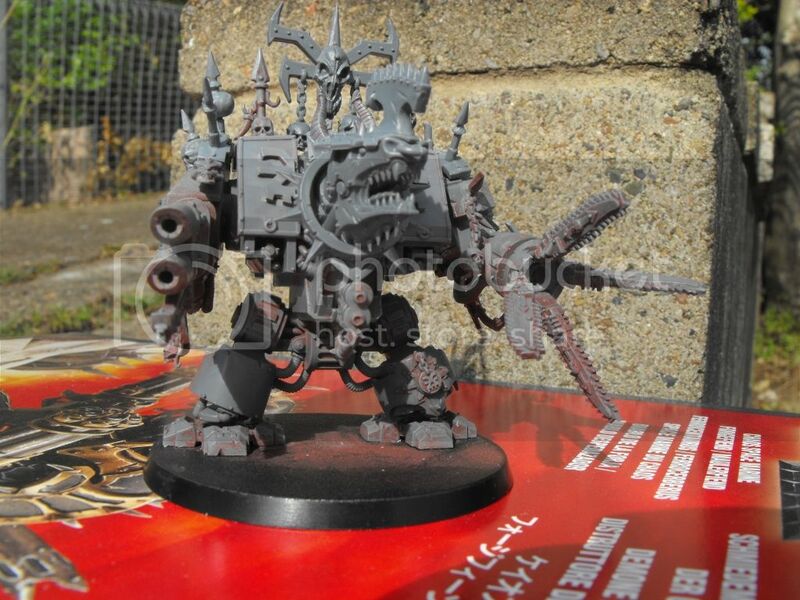 And I have finalised my Juggerdread build, all that remains is getting something to mount the exhaust gargoyles to the back, they are just blutac'd on for now. 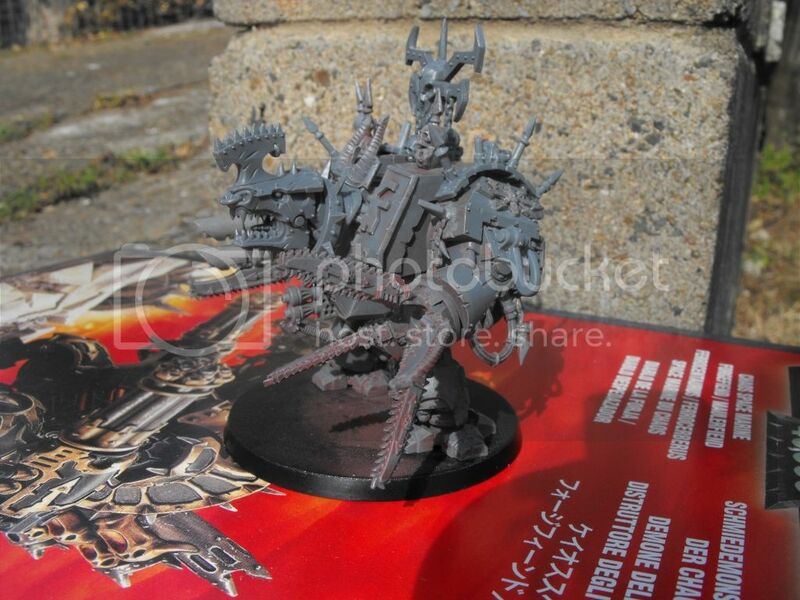 Edit: Here's a slightly better view of his neck, it's a combination of Jugger neck, Chaos Knight shield and pipey bits. Edited by Usiel, 06 November 2014 - 03:05 PM. 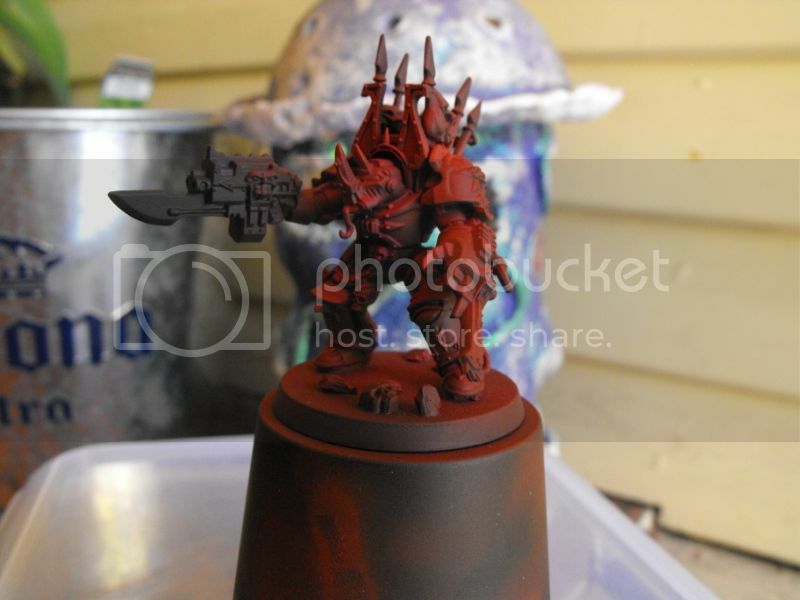 A little preview of what's forming from unholy rites on my desk, the rest of my time has been spent doing things less interesting to share; removing a horrid chocolate brown primer from the last of my World Eater army before the big repaint. 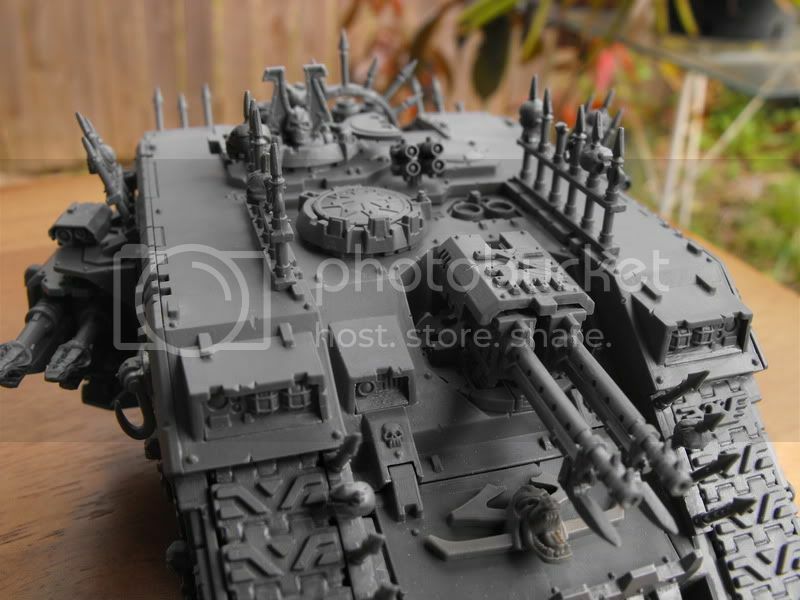 But here is the first model brought for the army in over 3 years. 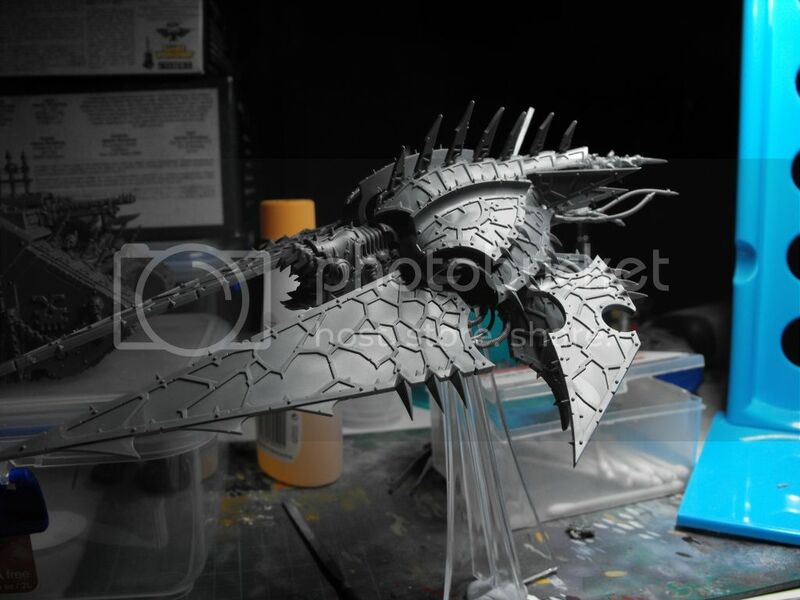 I was totally inspired by KrautScientist's take on Marshalfaust's Heldrake conversion and am proud to add another 'Hellrazor' to the 41st millennium. I also much preferred the Ecto-plasma head as it was much more daemonic and further removed it from its original 'space dragon' aesthetic, which all three of us seem to hold disdain for. 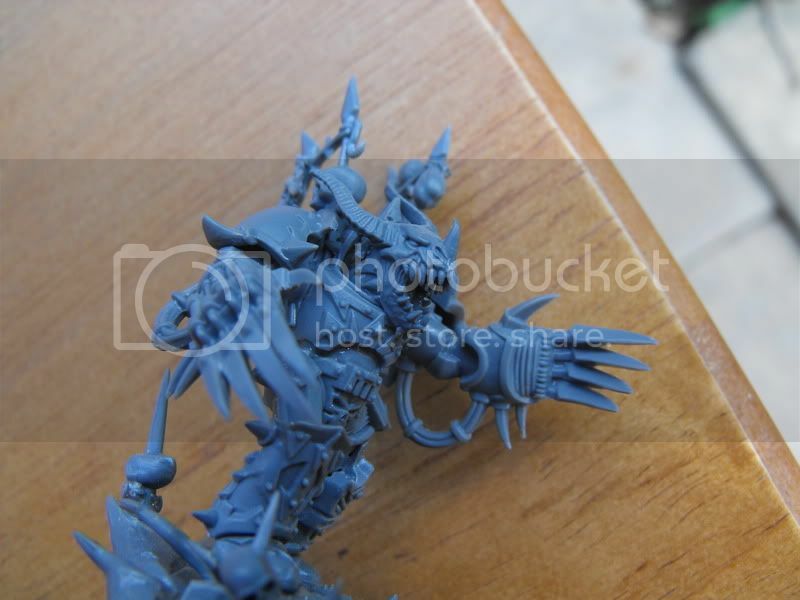 My addition to the conversion was taking the fins/vanes from its arms and using them to cover the top exhausts openings. I wanted to enhance its aerodynamic look and give a little more to its silhouette without going OTT. 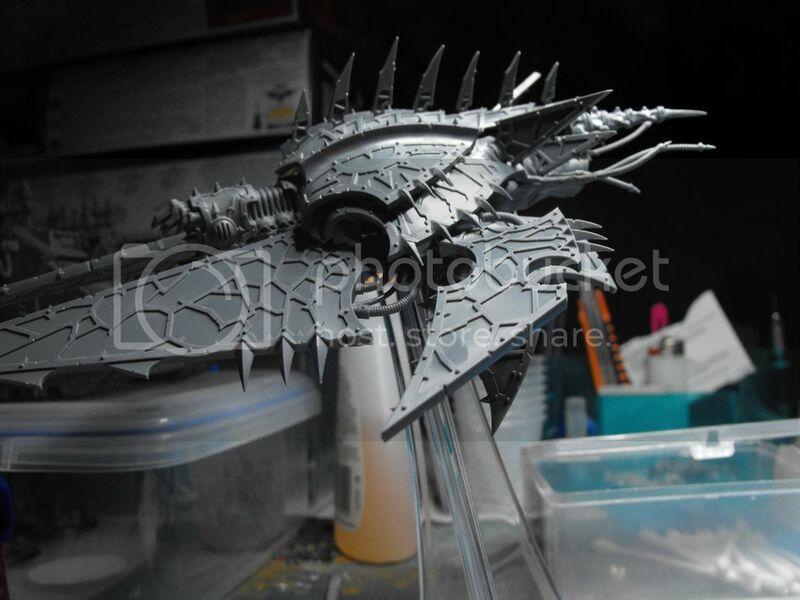 I'm intending to add some lasher tendrils to the underside too like its predecessors. 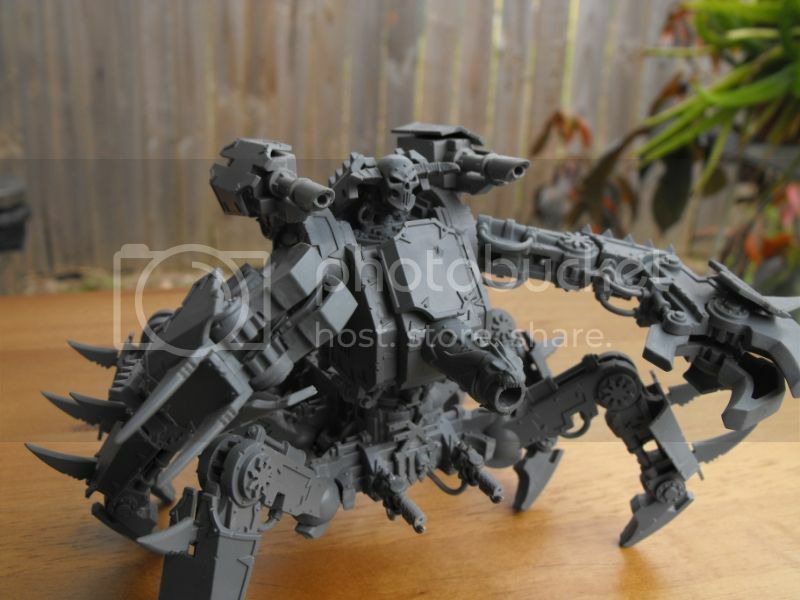 It's entirely dry fit and blutac'd together atm, I will share more shots of the finished build when it's all glued. 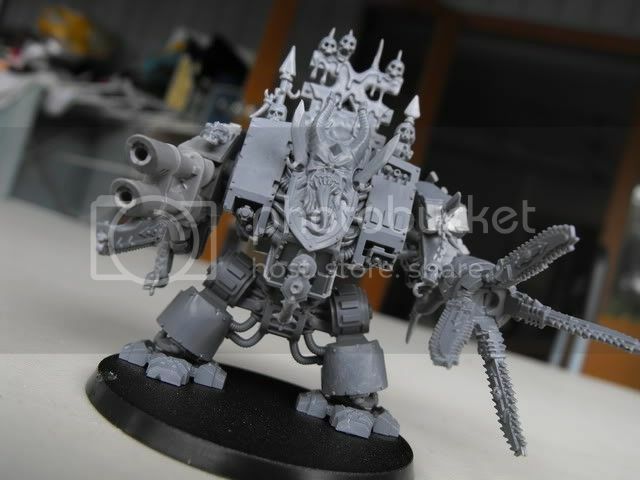 Using an actual jugger neck on the Dreadnought is a rather elegant solution! Great job! 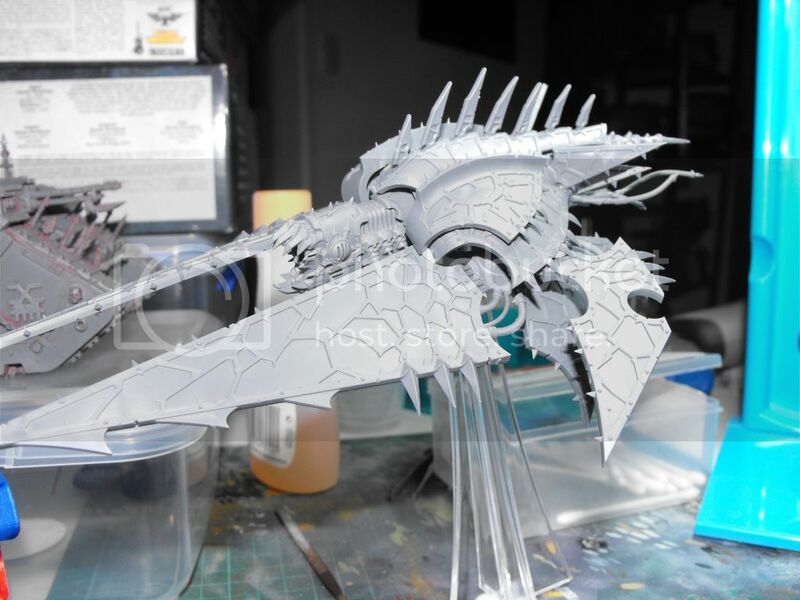 As for the "Hellrazor", I am of course feeling rather honoured that you would choose to build your Heldrake according to the pattern which I myself stole from Marshalfaust- Great idea about using the fins to plug those strange ...openings! If I have one suggestion, it would be to make sure the front wings, head and body are all generally following the same line of composition: Right now, it looks like there's a very slight but noticeable difference between the orientation of the wings and the rest of the body (I'm not sure I'm making sense, but take a look at the view from the side: It looks like there are several lines at work here, and you may want to bring them into alignment for the finished build).